Although Solomon was a monarch of great wealth and power, and by Biblical accounts, one of the greatest of the ancient Israelite kings, his sayings in the Book of Proverbs suggest that he viewed the rich with a fairly cynical eye. For Solomon, wealthy men who choose riches over wisdom, and have no respect for the virtues of prudence and justice are worse, than the poor who live honorable lives. “The rich man seemeth to himself wise; but the poor man that is prudent shall search him out,” says the ruler in Proverbs 28:11. In modern life, the wealthy and the, well, less-wealthy are on opposite sides of a divide created by changes in tax laws as a result of the last minute deal made on New Year’s Day to avoid the fiscal cliff. These changes are poised to hit the wealthy harder than the poor, with some benefits left over for investors on either side of that income divide. Although the new tax hikes affect nearly everyone, the very wealthy – those whose income derives more from investments and business ventures than paychecks – can expect a harder hit, thanks to several provisions in the deal. Some benefits remain in place, too, for property owners and investors on either side of the income divide. The first place many Americans will see an increase in taxes is their paycheck. Under the terms of the deal, payroll taxes will increase by 2 percentage points. According to a recent Business Week article, payroll taxes will rise from 4.2.percent to 6.2 percent. But for those earning less than $400,000 annually, income tax rates and taxes on capita gains and dividends remain unchanged. For property owners, though, there are a few bright spots remaining. The new deal kept the mortgage interest deduction in place; a key perk among the tax breaks offered to owners of residential and income property. And struggling homeowners dodged the bullet of new taxes on mortgage principal that’s forgiven in a short sale or loan modification. Eliminating this tax break would have placed an additional burden on homeowners already in crisis, and, financial experts feared imposing such a burden might jeopardize the slowly recovering housing market and the economy as a whole. Nothing is certain, they say, but death and taxes. Just how much is certain from the fiscal deal’s tax changes remains to be seen. For most Americans, the bite got bigger – but if you’re an investor following Jason Hartman’s recommendations or investing success, a few surviving breaks may ease the pain. 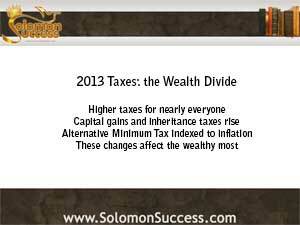 Would Solomon Approve of the Fiscal Cliff Deal?